May 11, 2015 - The Country's first free-standing campus center dedicated to the LGBTQ community celebrated its Grand Opening last week at the University of Rhode Island. 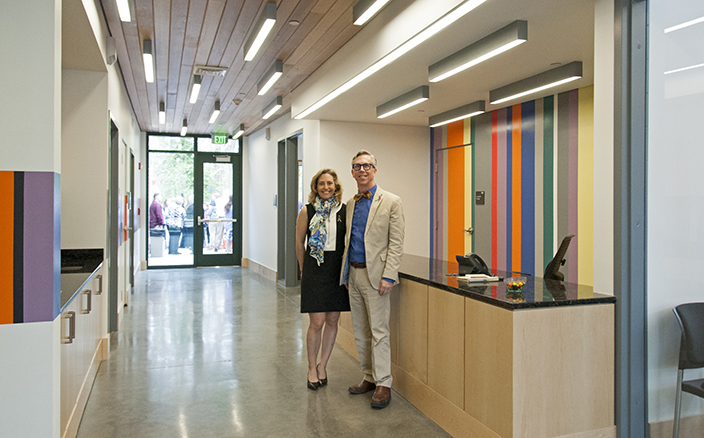 The new Gender and Sexuality Center serves as a testimony to LLB Architects' and the University's commitment to diversity by providing support for the LGBTQ community and its straight allies. Drayton Fair, Principal at LLB Architects, states "The design of the G&SC at URI is inspired by themes found in history and daily LGBTQ life. The stone facade on one volume of the building represents the strength and permanence of diversity while recognizing the 1968 Stonewall Riot in Greenwich Village. The pergola over the front entrance is representative of how often the community has had to be hidden. As a celebration of acceptance, the pergola is now a safe and open presence welcoming visitors to the Center."